Get smarter today! 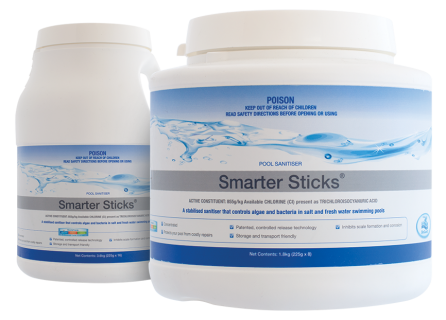 Smarter Sticks are a stabilised sanitiser that controls algae and bacteria in salt and fresh water swimming pools. Unlike traditional chlorine sticks, Smarter Sticks contain SilkGuard, a unique additive that attaches itself to hard water components and metal surfaces, protecting against corrosion and staining. Ensure sparkling clear and silky smooth water.